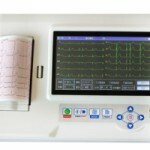 What is an Electrocardiogram (ECG) ? An electrocardiogram (ECG) is a simple test that examines the electrical conduction of the heart by looking at the heart rhythm. How is the ECG procedure done? The patient lies down on the bed and ten small electrodes are placed in certain areas on the chest, arms and legs. Wires are then attached to these electrodes and a ten second ECG is performed as the patient lies still. The ECG is quick and painless and generally only takes a couple of minutes. There is no preparation for an ECG. The Technician who performs the procedure will arrange for a Cardiologist to review the results immediately. A report will be forwarded to your referring Doctor. The report of ECG will usually be available within 24-48 hours.